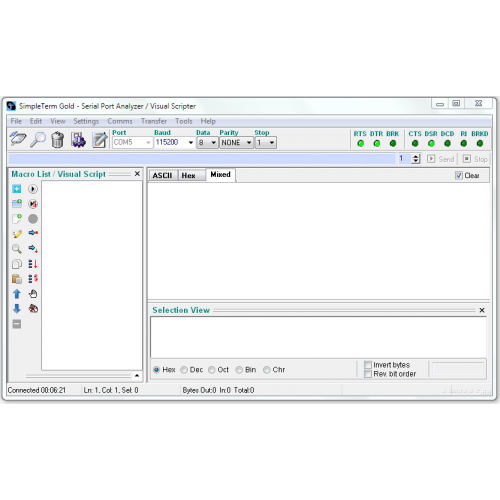 Advanced Serial Port Monitoring / Serial Port Data Viewer and Serial Protocol Analyser for all RS232, RS485 communicationss. SimpleTerm Gold - Professional Edition allows Unlimited Instances & Unlimited Macro Items (Dependant on your system limitations). Number one choice in professional RS232 monitoring software! BAE Systems, 3M , Atmel/Microchip Corporation, NASA/NSBF - National Scientific Balloon Facility, Comtrol Corporation, Siemens, Stannah Lifts, Braun GmbH, Technotron, Meggitt Avionics, CAS Medical Systems, Smiths Medical PM, Logical Development, Weber Engineering, Sobotta GmbH, Videcom Security, Mediatech , Quatro Zero, Servomex, ABH Mechatronix, Meyertech Ltd, Xperteam Networking, Fearnside Systems Ltd, SoftPart, EADS Deutschland GmbH, Radime Limited, Delta Intellection, Gemini Data Loggers, Dept of Medical Engineering Frenchay Hospital, Wizbangdesigns, Eltron LLC, Moderntech, Elliotttech, Transcore, Southern Atlantic Label, Direct Digital Controls, Ibak Helmut Hunger GmbH & Co. KG, InfiMed Inc, Rochford Thompson, Multiba GmbH, Plantronics, Netcentrics, RCS LTD, Glasson Electronics Ltd, DRS Optronics, Acequia LP, Airco Engineering Ltd, KATRON TECHNOLOGIES INC, TUSGSAL, Symphonic Residential Systems Inc, Agroalimentare F.lli Monaldi SpA, RF Insight, LOGSYS, Aqualogics... (thank you for your custom)! Shareit supports various payment types including Paypal or WorldPay. 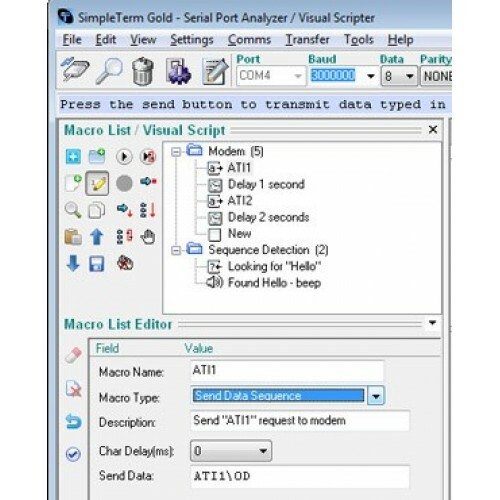 SimpleTerm Gold is an advanced serial port monitor, simulation and RS232 data capture and analysis tool. Use to log, monitor, analyse or automate RS232 communication or simply use as an ASCII RS232 Terminal for basic serial port communication and RS232 device configuration. It is a high performance 32-bit application designed to run on almost all PCs running Microsoft Windows 98, NT, 2000, 2003, XP, Vista and Windows 7 (32 & 64 Bit Editions). 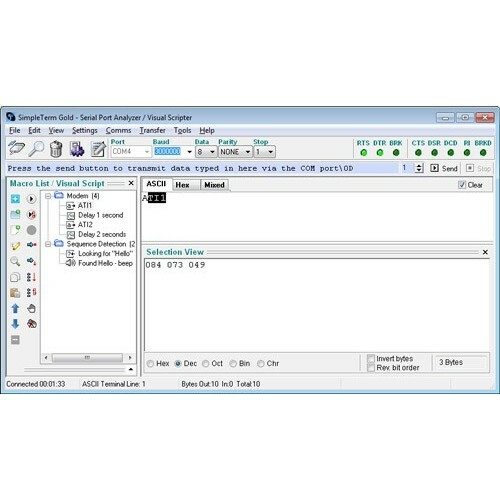 SimpleTerm Gold - Serial Port Monitor is a thoroughly tested, mature, highly stable product used worldwide by professional engineers, technicians and software developers as a development aid and debugging tool for RS232 / serial port related projects. 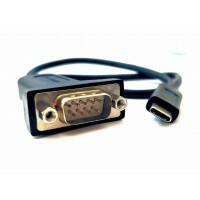 It's easy to use "simple" user interface also makes it a favourite amongst serial port novices and professionals alike. Don't take our word for it - try out the free evaluation versions! 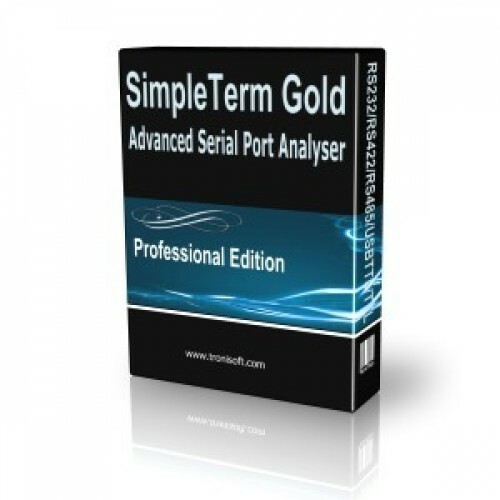 SimpleTerm Gold - Serial Port Monitor will work with the serial / COM ports provided by your operating system. 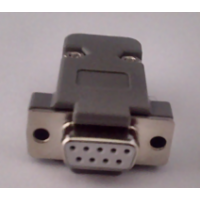 Physically, these ports will be RS232 SUB D9 serial port interfaces in most cases. However, it is also possible to use SimpleTerm for other communication standards such as RS485 and RS422, which have a different electrical design to RS232 but follow the RS232 communication mechanism. 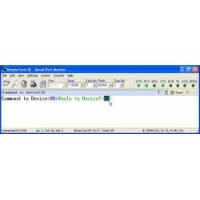 Also supported are Virtual COM ports presented by e.g. USB-Serial adaptors & Bluetooth™ Serial Port Profile devices. 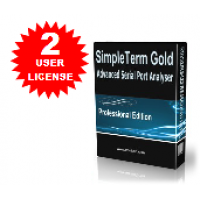 SimpleTerm Gold is also known as an RS232 Analyzer as it provides superb data viewing and capture features for post analysis. It comes with popular CRC analysis as standard. SimpleTerm Gold - Professional Edition can let you run unlimited Macro items. Run unlimited instances on your machine (dependant on your PC/Laptop). 1 year of free minor upgrades and 50% off future major license versions. Priority email support & technical support for our software. 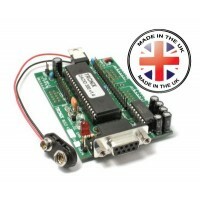 Professional Edition is designed for Commercial use on a named user basis or Engineers on a named user basis who require a high quality product that can meet their needs and be deployed quickly for use as one of their essential tools in debugging, simulating and monitoring RS232 / RS485 communications. The software can only be installed on a single computer or a named user you would like licensed, license is not transferrable from one computer to another or one user to another. depending on your system resources (i.e. PC/Laptop/Server). 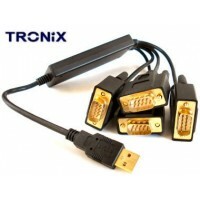 ** On sale - limited time offer ** ** World Class TRONiX brand with "just works" driver supp.. The DACIO 300 series modules are powerful, ultra low power consumption, microcontroller (MCU) bas..
SimpleTerm SE - Commercial / Professsional User License. 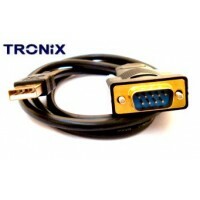 RS232 Monitor / RS232 Terminal / COM P..
TRONiX USB to RS232 DB9 Serial Adapter (Prolific PL2303HX Rev D Chipset) ** See also similar ..
SimpleTerm Gold - Professional Edition. 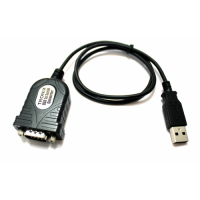 Advanced Serial Port Monitoring / Serial Port Data..
A RS232 / Serial Loopback Tester designed to help test you either test your 9 Pin RS232 devices ..
** New in stock with USB Type C connector for newer laptops and PCs! ** ** World Class TRONi..